We will soon begin a test period with a new mapping provider. This test could begin as early as today, June 28. If your map preferences are set to MapQuest OSM or MapQuest Aerial, then your default map will automatically change. If you don’t like the new map, you can choose a different mapping option by going to View Geocache Map and clicking the Set Map Preferences button. Then tap the tile icon in the upper right corner of the map. Premium Members who have chosen Google Maps in their Map Preferences are unaffected by this change. 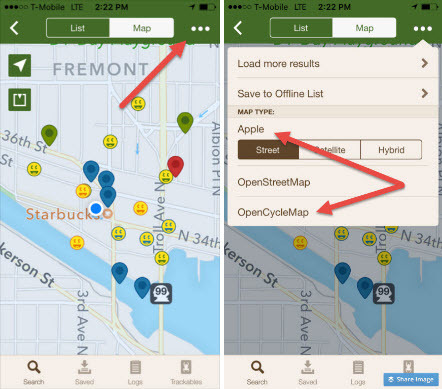 Both Apple Maps and OpenCycleMap will continue to function. To download maps for offline, you must select OpenCycleMap and de-select OpenStreetMap. Lists that have been saved for offline with OpenStreetMap before the July 11 deadline should continue to function. Ben H and David P from HQ’s Product Team will monitor this thread and answer questions when possible. Any questions/comments should be related to features in this release. Any unrelated comments should be directed to other appropriate threads. Thank you! In case you aren't aware (though you probably are), some of us have been discussing this issue over here. As discussed in that discussion, it appears that "MapBox Streets" may become the new default layer, but that rendering is largely useless for geocaching purposes. If that's the "new provider", please reconsider and investigate other options, or at least allow us to change the default (both on the large map and on the cache listings). In case you aren't aware (though you probably are), the original post stated that this will be a "test period." It would be a mistake to assume that whatever appears today or tomorrow or whenever the test period begins is the final product. Otherwise, it wouldn't be a "test period." Also as stated in the original post, you can change the default on the large map. There's instructions and a screenshot and everything. There are no plans to change the map settings on the Cache Details page to allow for a change in default. Understood. However, whether the MapBox Streets layer is just used during testing and later abandoned or it's later chosen as the final solution, the problem of usability still exists at least for the duration of the test period. Unless I'm completely missing something, the only option I can change is the map rendering platform: Google or Leaflet. I can't see anywhere to change the default layer within the Leaflet platform. Should I be seeing that option if I click on "Set Map Preferences"? I don't know if there's a misunderstanding or a bug here. In case you aren't aware (though you probably are), the original post stated that this will be a "test period." Wouldn't it be possible to do the first tests in some test environment and not in the real system? I just had a look at a newly published cache and an empty map was shown. Then I realized that I need to zoom out to the 1km level. If that type map is going to stay and cannot be changed to something else, the maps on the cache pages will become useless. Edit: Later the old map was back. What happens seems quite unstable. They have, on the staging server. It was noticed and mentioned in the other thread. Has it ever been possible to do this? Or rather, to choose a different map from that list as your favorite, eg OpenCycleMap, and have it "stick" as the default within that large map? I've long wished for that feature. And while I'm tilting at windmills, "Leaflet" is just the name of the plumbing layer. (Have I mentioned this?) You'd catch a lot more attention with "OSM and More". OSM has grown up; it's the cool map now (map family to be accurate). Also as stated in the original post, you can change the default on the large map. I guess you use large map differently than it is often used here - you probably talk about the map that shows all search results and not the individual map showing in each cache page. Until a few days ago we had a small and a large map there and the larger one is the one I have in mind when someone talks about the large map. This map on the cache page is of importance as it shows all (public) waypoints of a cache and not just the header coordinates. I was just looking at the map and realized the default layer has changed again. Rather than MapBox Streets, it's now using MapBox Outdoors. This is definitely an improvement. Trails and tracks are rendered in yellow, so they show up much better. They also start rendering at zoom 15 (tracks at zoom 14), which is better than the zoom 16 used by MapBox Streets and the old MapQuest OSM. It also has contour lines, which enhances the low-quality hillshading such that it's more useful and meaningful. It would be nice if more areas were rendered and buildings were rendered earlier, but I'd say this is a better option than MapBox Streets. Groundspeak, if feedback is being collected, I'd support the usage of MapBox Outdoors as a replacement for MapQuest OSM, pending the possible future trial of other options. Once a permanent map provider has been chosen, will the mini-map near the top of cache listings be returning, or has that been retired permanently to reduce map usage? That map was always handy to quickly determine the general area of a cache without having to scroll down to the other map, so it would be appreciated if it could be brought back. Two thumbs up for MapBox Outdoors. I could've sworn I looked at that style on the MapBox site a few days ago, and found it lacking. Specifically, lacking OSM. But I think there are different flavors of MBO (this one appears to be V9), and it looks very OSM-y. And utterly unlike the outgoing map, very up to date. Hope we can afford it. Aesthetically, meh, I can get used to it. But functionally, it pushes all the right buttons. PS, getting MapBox Satellite as part of the bargain is an extra bonus. (MQ Satellite never ever worked for me.) Just now I checked the geo-situation for an area I'll be hiking into shortly, and on MapBox Satellite I see a nice clear winter image, and on Esri Worldimagery I see a nice clear summer image. Sweeet..
People who stay over on the Google side don't know what they're missing. I would be glad if there's a possibility to define my own default map instead of switching the map every time (i prefer OSM german style). YUK! Yesterday great, choices!!.... Today, No choices= Google Map/Satellite. Today's test period= not impressed. Two thumbs down for MapQuest OSM. There. I never got around to saying it until now. It's still updated roughly never, and while it looks reasonably nice, there are no contour lines, and ... have I mentioned it being out of date? I mention this because I see we're back, if perhaps only temporarily, to MapQuest OSM. I hope this is just the final part of your test, and that you'll soon go back to MapBox Outdoors. Which I think is the best option you've tried, by far.